the shape of the typography in this work came about because of the way the lyrics wove together—in my mind, like a circular square: an endless completeness to it like a circle, but with solid, square corners as a strong foundation. The rough-edged and abstract center cross is inspired by Isaiah 53:5, “...and with his stripes we are healed,” and is constructed from a weaving of colors representing the spectrum of the human race for whom He died, of which the individual threads are our names, written in His Book of Life. 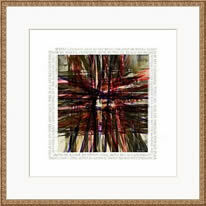 This unframed print is not a standard size, so it will require custom matting and framing. for my pardon this my plea-nothing but the blood of Jesus. naught of good that I have done-nothing but the blood of Jesus. this is all my righteousness-nothing but the blood of Jesus. now by this I’ll reach my home-nothing but the blood of Jesus.